CIE Global qualifications are very flexible and are designed and developed based on action and experiential learning practice; which enables learners to achieve knowledge and experience to build up their career in the desired field. CIE Global qualifications lead to the higher education, employment or business; which delivers well-trained and qualified employees, entrepreneurs, innovators and leaders for the sector. Our qualifications are designed and developed by the team of high educated and well qualified specialists in the sector where most of the members are professional and have real life experience of working in the sector. We are also in the process of designing high quality real life simulative sample study materials which will help our learners to explore and utilise their knowledge more efficiently and our centres to develop their own quality materials according to industry standards and needs. We provide interactive vocational, academic and professional qualifications in many areas at different levels through our accredited centres (educational institutions, training providers and employers). To develop our high-quality industry linked qualification, we follow the IQF (Interactive Qualification Framework). Apart from formal and institutional learning, we also recognise non-formal and informal learning, as we believe learning is not limited to any systems or boundaries. IQF also enables a learner or worker from other countries to get his/her qualifications mapped to the global standard and be recognised. 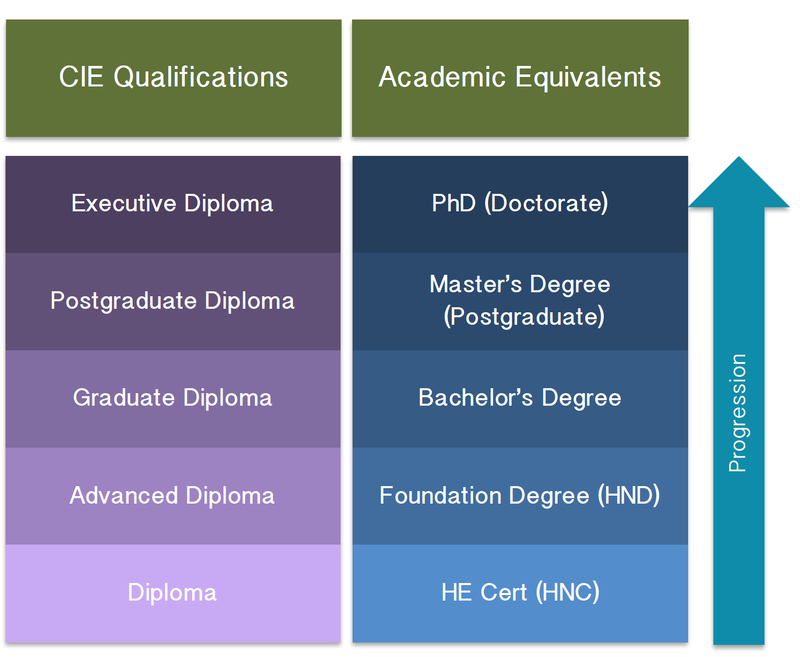 The level of CIE Global qualifications can be mapped across other frameworks such as NQF, QCF, RQF and FHEQ in the UK, CQFW in Wales, SCQF in Scotland, EQF in Europe, NZQA in New Zealand and AQF in Australia. CQF (Customised Qualification Framework) is a very attractive bespoke qualification development solution enabling Employers, Education and Training Providers to design and develop unique qualifications according to their needs to satisfy the demand of the industry. Our customers give their own needs, designs and specifications for the customised qualifications and we provide the quality assurance and awarding of the qualifications. A specifically customised qualification is exclusive to a specific customer. CQF follows the IQF qualification design and development system that ensures the quality and standards are externally assured by CIE Global. If you are interested in developing bespoke qualifications or wish to get accreditation for the qualifications and training you currently offer, please go to Become a Centre page and follow to steps.